Melinda L. Secor left a 20-year career in health care and developmental disabilities to become a full-time freelance writer. In addition to blogging regularly, she writes for numerous websites on a wide range of topics that include politics, finance, homeschooling, parenting, sustainable living/self sufficiency, health, developmental disabilities, gardening and many others. 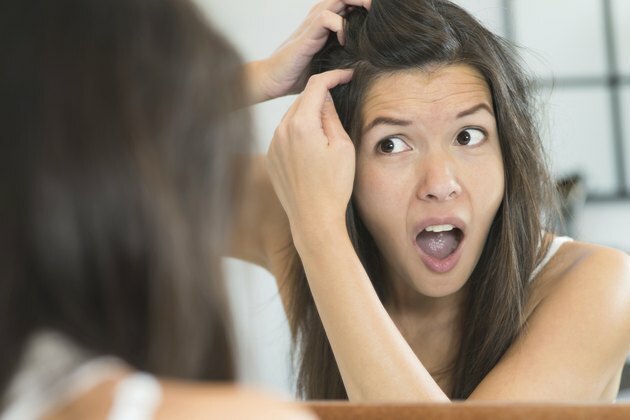 Dandruff is a very common chronic skin condition, characterized by dry, flaking skin on the scalp and often accompanied by itching that ranges from mild to intense. Dandruff is not contagious, nor is it a serious condition, but it can be uncomfortable and embarrassing for those who suffer its effects. Although the exact cause of dandruff is undetermined, certain factors are known to contribute to its development. According to the Mayo Clinic, these factors include stress, poor nutrition, hormonal changes, immune system weakness and oily skin. Certain vitamins and minerals can help keep the skin and scalp healthier and support the immune system, helping to address some of the factors that can contribute to dandruff. Vitamin A is essential to skin health, playing vital roles in the circulatory system and immune system as well as supporting the maintenance and function of skin cells, according to the Linus Pauling Institute Micronutrient Information Center. Ensuring that you include enough vitamin A in your diet can help improve skin and scalp and boost immune system function--which may help alleviate dandruff symptoms. Adding foods such as liver, dairy products and eggs to your diet helps increase vitamin A intake, and yellow vegetables such as carrots, sweet potatoes and squash are also rich in vitamin A. Fruits that are good sources of vitamin A include cantaloupe, apricots, peaches and papaya. According to the National Institute of Health, Office of Dietary Supplements, B vitamins are vital to many body functions. They participate in the creation and growth of new cells. Circulation and metabolism are supported by B vitamins, as is healthy skin. Ensuring that there are plenty of B vitamins in your diet can help keep your scalp healthy and dandruff free. Foods rich in B vitamins are meats, poultry, dairy foods and eggs. Whole grains are rich sources of B vitamins, as are green leafy vegetables, legumes, potatoes and bananas. Well known for its support of the immune system, vitamin C can help prevent conditions that can be triggered by weakened immunity, such as dandruff. According to the Linus Pauling Institute, Micronutrient Information Center, vitamin C also helps support the circulation system, which supports skin and scalp health. Adding citrus fruits such as oranges, lemon, lime and grapefruit to your diet is a great way to increase vitamin C intake. Kiwi fruit is very rich in vitamin C, as are strawberries. Vegetables that are rich in vitamin C include spinach and other greens, Brussels sprouts, chili peppers and green peppers. According to the National Institute of Health, Office of Dietary Supplements, zinc is a mineral that's necessary for healthy cell growth and development. Healthy cell growth is essential to the maintenance of health in the skin, scalp, hair and nails. Zinc deficiency can increase the risk of developing skin conditions such as dandruff and eczema. Meats, poultry, seafood and nuts are rich in zinc.